You'll be £25.00 closer to your next £10.00 credit when you purchase The American Sharpe. What's this? Sharpe and his adventures has made the 95th Foot renowned again and the discovery of an unpublished diary by an American from Charleston South Carolina who served, despite his father’s objections, as an officer in this elite regiment has caused great excitement. James Penman Gairdner was born in Charleston, South Carolina, but he was sent back to the ‘Old Country’ for his education, receiving his schooling at Harrow. After school, rather than joining his father’s merchant business he decided to become a soldier, receiving a commission in the famous 95th Rifles. He subsequently served, without a break, from the siege of Ciudad Rodrigo in January 1812 until the end of the war in 1814. He then fought in the Waterloo campaign and formed part of the Army of Occupation. He was wounded on three occasions. Throughout his service he kept a journal, which he managed to maintain on almost a daily basis. This journal, along with a number of letters that he wrote to his family, have been edited by renowned historian Gareth Glover and are presented here to the public for the first time. Readers will not find dramatic stories of great battles or adventurous escapades. Instead, Gairdner, details the everyday life of one of Wellington’s soldiers; one of marches and billets, of the weather, the places and the people of the Iberian Peninsula and of Paris and Occupied France – the real nature of soldering. His diaries also highlight the very strange relationship between these newly independent Americans and the ‘Old Country’ they had so recently fought with; which even allowed for a true American boy to fight in the British Army, but not in America! The transcription of the Gairdner papers kept at the National Army Museum in London became urgent because of the rapid deterioration of the ink which might soon make them completely illegible; it is therefore appropriate to welcome this editorial project which leaves an extremely interesting document out of oblivion. This chronicle of an American who fought for Britain gives a unique perspective on the Napoleonic Wars. 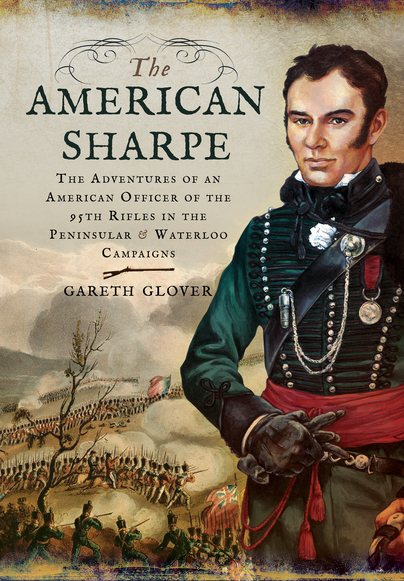 I'm pretty certain that the man described in this book about the "American Sharpe" is referring to Bernard Cornwell's best-selling series about a British Army officer - this real-life Sharpe is larger than life in every sense and his own story is absolutely amazing!